“The Blank Slate” is an ode to human nature and scientific thought in public debate. Pinker masterfully summarizes what scientists have learned about the genetic and environmental influence on human behavior, both as individuals and as members of groups, and what it means for the organization of our lives. In a nutshell he argues that humans are not born “blank slates” and can’t be made to fit any utopian society or be trained any behavior. Denying human nature isn’t only futile, it makes us miserable and, needless to say, it’s unscientific. The book is an interesting and well-written review of research on the nature-nurture debate. But for me its real value is that Pinker puts the scientific knowledge into the historical and social context and relates it to “hot buttons” in public debate, such as gender equality, war, or parenting advice. I’ve been asked at least half a dozen of times if I read “The Blank Slate” and now I know why. The arguments Pinker leads are arguments I’ve led myself many times, if less elegantly and not backed up with references as thoroughly. You’ll find there my ambivalent attitude to feminism, my disliking of postmodernism, my hesitation to take on pretty much any parenting advice, my conflicted relation to capitalism, and my refusal to accept morals or social norms as rules. I’ve had a hard time finding something to disagree with. I was almost relieved to find that Pinker believes in free will, just because I don’t. So for the most part, Pinker’s arguments haven’t been new to me. That might partly be because the book is ten years old now and its content was conceivably reflected in other literature I read after it appeared. But Pinker connected for me many dots whose relation wasn’t previously clear to me. Much of the public discussion about the “hot buttons” he refers to took place in the United States, though these topics arguably surface also in Europe, if not with quite as much noise. Before I read the book I never really understood why these issues were controversial to begin with and why people are evidently unable to have a reasoned discussion about them. The world makes a lot more sense to me after having read the book, because I now understand better the historical and social origin of these tensions. It took me a long time to get through the book. One reason is simply that the paperback version is 430 pages in small font, I’m short-sighted and it’s just many tiny words. Another reason is that Pinker’s arguments become somewhat repetitive after the first 100 pages or so. Yes, yes, I got it, I wanted to say, can we please move on because I got another ten books waiting. This repetition of the main theme is however greatly alleviated by Pinker’s fluid and witty writing. You really don’t want to miss a page. In summary, the book is a must-read, it’s a classic already. If you read one non-fiction book from the last decade, that’s the one. Stars have no privacy. Not only does NASA unashamedly collect extensive records of star’s data, they’re not even denying they do. NASA’s surveillance program has the sole intent to stare at stars, and to stare intensely, just for the sake of collecting knowledge. NASA’s Kepler satellite has been looking for more than three years at a small patch of the Milkyway that hosts an estimated 145,000 stars similar to our own sun. 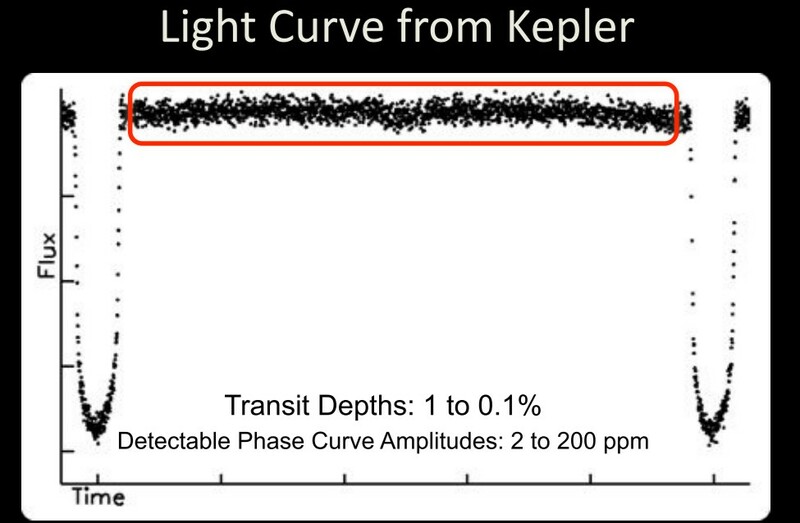 The data that Kepler gathered, and still gathers, is analyzed for transits of planets that temporarily block part of the star’s surface and diminish its emission. The precision by which this detection can meanwhile been done is simply amazing. 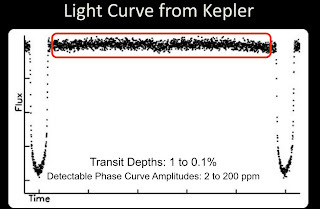 The Kepler mission so far found more than 2000 planet candidates that are now subject to closer investigation. Ray Jayawardhana gave a great lecture on exoplanets at Nordita’s recent workshop for science writers, slides are here. The progress in the field in the last decades can’t be called anything but stellar. To see just how much progress has been made, look at page 13 of Ray's second lecture. You see there a time-series of measurements of the flux from some star observed with Kepler. You clearly see the dips when then planet covers part of the surface, a decrease that isn’t more than a tenth of a percent. I went away from Ray’s lecture thinking I should read his book, but was also left wondering if not the close monitoring of the stars should pick up sunspot activity and what we know about solar cycles of stars other than our own. That starspots exist was first proposed in 1667 by the French astronomer Ismael Bouillau. The first starspots were recorded in the 1940s, but not recognized as such. In the late 60s and early 70s, several research groups independently proposed star spots as an explanation for certain types of light variability of stars that had been observed. Some white dwarfs show spectral variations on a timescale of hours and days that are believed to be caused by sunspots. Similar structures are probably present on the surfaces of neutron stars as well. 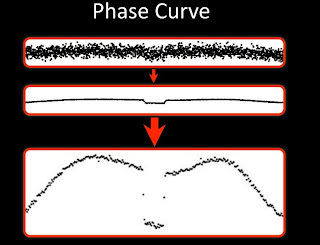 Monitoring star spots allows to extract the rotation period of the star. According to presently existing models of stellar evolution, the rotation of stars changes with mass and age. Star spots can thus provide relevant data to find out which of these models is correct and thereby teach us how stars like our own evolve. 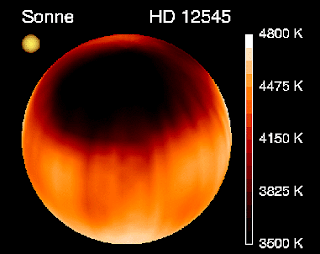 Doppler imaging of the stars emission spectrum allows in principle to reconstruct the latitude of the spot, though in practice reconstruction can be difficult. There’s two different types of spots. The spots at low to mid latitude that we know from the sun, and polar spots that cover a pole of the star. The polar spots are thought to be caused by magnetic fields produced by a distinctly different mechanism than the other spots. In: Berdyugina, "Starspots: A Key to the Stellar Dynamo"
Out of 65 stars whose surface emission was analyzed with the Doppler technique, 36 had polar spots. The polar spots can be very long lived and survive up to a decade. There seems to exist no strong correlation between temperature and size of the star spots. Most spotted stars have a cycle similar to that of the sun with a period in the range 3-21 years. Some stars probably have longer cycles, but existing observations don’t yet allow extracting it. But about a third of the observed stars seem to have no cycle or have one with large variations between the periods. The lifetime of a sunspot is probably not determined by the decay of its magnetic field but by the surface shear due to differential rotation. Spots on tidally locked binary systems live longer (on the average several months) than spots on single main-sequence stars (on the average several weeks). Solar-type stars show the most sunspot activity when in the surface temperature is in the range 4900 - 6400 K.
Some starspots spin. This has not (yet) been observed on our sun’s spots. How stable is the photon? Yes, the photon. How stable is the photon? The photon is normally assumed to be massless. While a photon mass breaks gauge invariance and seems unappealing from a theoretical perspective, in the end it’s an experimental question whether photons have a mass. And while the mass of the photon is tightly constrained by experiment, to below about 10-18 eV, the mere possibility that it may be non-zero brings up another very basic question. If the photon has a mass it can decay into other particles, for example a pair of the lightest neutrino and its anti-partner, or other so-far undiscovered particles beyond the standard model. But if decay is possible, what are the bounds on the life-time of the photon? That’s the question Julian Heeck set out to address in his paper. If the photon is unstable and decays into other particles, then the number density of photons in the cosmic microwave background (CMB) should decrease while the photons are propagating. But then, the energy density of the spectrum would no longer fit the almost perfectly thermal Planck curve that we observe. One can thus use the CMB measurements to constrain the photon lifetime. If one uses the largest photon mass presently consistent with experiment, the photon lifetime is 3 years in the restframe of the photon. If one calculates the γ-factor (ie, the time dilatation) to obtain the lifetime of light in the visible spectrum it turns out to be at least 1018 years. It’s rare to find such a straight-forward and readable paper addressing an interesting question in particle physics. “Cute” was really the only word that came to my mind. You probably have no free will. But don’t worry about it. Anybody who believes in reductionism and that the standard model of particle physics is correct to excellent precision must come to the conclusion that free will is an illusion. Alas, denial of this conclusion is widely spread, documented in many attempts to redefine “free will” so that it can somehow be accommodated in our theories. I find it quite amusing to watch otherwise sensible physicists trying to wriggle out of the consequences of their own theories. We previously discussed Sean Carroll’s attempt, and now Carlo Rovelli has offered his thoughts on free will in the context of modern physics in a recent Edge essay. Free will can only exist if there are different possible futures and you are able to influence which one becomes reality. This necessitates to begin with that there are different possible futures. In a deterministic theory, like all our classical theories, this just isn’t the case - there’s only one future, period. The realization that classically the future is fully determined by the presence goes back at least to Laplace and it’s still as true today as it was then. Quantum mechanics in the standard interpretation has an indeterministic element that is a popular hiding place for free will. But quantum mechanical indeterminism is fundamentally random (as opposed to random by lack of knowledge). It doesn’t matter how you define “you” (in the simplest case, think of a subsystem of the universe), “you” won’t be able to influence the future because nothing can. Quantum indeterminism is not influenced by anything, and what kind of decision making is that? Another popular hiding place for free will is chaos. Yes, many systems in nature are chaotic and possibly the human mind has chaotic elements to it. In chaotic systems, even smallest mistakes in knowledge about the present will lead to large errors in the future. These systems rapidly become unpredictable because in practice measurement always contains small mistakes and uncertainties. But in principle chaos is entirely deterministic. There’s still only one future. It’s just that chaotic behavior spoils predictability in practice. That brings us to what seems to me like the most common free will mirage, the argument that it is difficult if not impossible to make predictions about human behavior. Free will, in this interpretation, is that nobody, possibly not even you yourself, can tell in advance what you will do. That sounds good but is intellectually deeply unsatisfactory. To begin with, it isn’t at all clear that it’s impossible to predict human behavior, it’s just presently not possible. Since ten thousand years ago people couldn’t predict lunar eclipses, this would mean the moon must have had free will back then. And who or what makes the prediction anyway? If no human can predict your behavior, but a computer cluster of an advanced alien civilization could, would you have free will? Would it disappear if the computer is switched on? And be that as it may, these distractions don’t change anything about the fact that “you” didn’t have any influence on what happens in the future whether or not somebody else knew what you’ll do. Your brain is still but a machine acting on input to produce output. The evaluation of different courses of action can plausibly be interpreted as “making a choice,” but there’s no freedom to the result. This internal computation that evaluates the results of actions might be impossible to predict indeed, but this is clearly an illusion of freedom. To add another buzzword, it also doesn’t help to refer to free will as an “emergent property”. Free will almost certainly is an emergent property, unless you want to argue that elementary particles also have free will. But emergent properties of deterministic systems still behave deterministically. In principle, you could do without the “emergent” variables and use the fundamental ones, describing eg the human brain in terms of the standard model. It’s just not very practical. So appealing to emergence doesn’t help, it just adds a layer of confusion. Rovelli in his essay now offers a new free will argument that is interesting. First he argues that free will can be executed when external contraints on choice are absent. He doesn’t explain what he means with “external constraints” though and I’m left somewhat confused about this. Is for example, alcohol intoxication a constraint that’s “external” to your decision making unit? Is your DNA an external constraint? Is a past event that induced stress trauma an external constraint? Be that as it may, this part of Rovelli’s argument is a rephrasing of the idea that free will means it isn’t possible to predict what course of action a person will take from exclusively external observation. As we’ve seen above, this still doesn’t mean there are different future options for you to choose from, it just means prediction is difficult. Then Rovelli alludes to the above mentioned idea that free will is “emergent”, but he does so with a new twist. He argues that “mental states” are macroscopic and can be realized by many different microscopic arrangements. If one just uses the information in the mental states - which is what you might experience as “yourself” - then the outcome of your decisions might not be fully determined. Indeed, that might be so. But it’s like saying if you describe a forest as a lot of trees and disregard the details, then you’ll fail to predict an impending pest infection. Which brings us to the question whether forests have free will. And once again, failure to predict by disregarding part of the degrees of freedom in the initial state doesn’t open any future options. In summary, according to our best present theories of nature humans don’t have free will in the sense explained above, which in my opinion is the only sensible meaning of the phrase. Now you could dismiss this and claim there must be something about nature then that these theories don’t correctly describe and that’s where free will hides. But that’s like claiming god hides there. It might be possible to construct theories of nature that allow for free will, as I suggested here, but we presently have absolutely zero evidence that this is how nature works. For all we know, there just is no free will. People are afraid of the absence of free will not because it’s an actual threat to well-being, but because it’s a thought alien to our self-perception. Most people experience the process of evaluating possible courses of action not as a computation, but as making a decision. This raises the fear that if they don’t have free will they can no longer make decisions. Of course that’s wrong. To begin with, if there’s no free will, there has never been free will, and if you’ve had a pleasant and happy life so far there is really no reason why this should change. But besides this, you still make your decisions. In fact, you cannot not make decisions. Do you want to try? And the often raised concern about moral hazard is plainly a red herring. There’s this idea that if people had no free will “they” could not be made responsible for their decisions. Scare quotes because this suggests there are two different parts of a person, one making a decision and the other one, blameless, not being able to affect that decision. People who commit crimes cause pain to other people, therefore we take actions to prevent and deter crime, for which we identify individuals who behave problematically and devise suitable reactions. But the problem is their behavior and that needs to be addressed regardless of whether “they” have a freedom in their decision. I believe that instead of making life miserable accepting the absence of free will will improve our self-perception and with it mutual understanding and personal well-being. This acceptance lays a basis for curiosity about how the brain operates and what part of decision making is conscious. It raises awareness of the information that we receive and its effect on our thoughts and resulting actions. Accepting the absence of free will doesn’t change how you think, it changes how you think about how you think. The highest energetic particle collisions that we observe on our planet are created by particles from outer space that hit atomic nuclei in Earth’s upper atmosphere. The initial particle produces a large number of secondary particles which decay or scatter again, creating what is called a cosmic ray shower. The shower rains down on the surface where it is measured in large arrays of detectors. The challenge for the theoretical physicist is to reconstruct the cosmic ray shower so that it is compatible with all data. In practice this is done with numerical simulations in which enters our knowledge about particle physics that we have from collider experiments. One of the detectors is the Pierre Auger Observatory whose recent data has presented some mysteries. One mystery we already discussed previously. The “penetration depth” of the shower, ie the location where the maximal number of secondary particles are generated, doesn’t match expectation. It doesn’t match when one assumes that the primary particle is a proton, and Shaham and Piran argued that it can’t be matched either by assuming that the primary is some nuclei or a composite of protons and nuclei. The problem is that using heavier nuclei as primaries would change the penetration depth to fit the data, but on the expenses that the width of the distribution would no longer fit the data. Back then, I asked the authors of the paper if they can give me a confidence level so I’d know how seriously to take this discrepancy between data and simulation. They never came back to me with a number though. In the paper the authors go through possible explanations for this mismatch between data and our understanding of particle physics. They discuss the influence of several parameters on the shower simulation and eventually identify one that has the potential to influence both, the penetration depth and the number of muons. This parameter is the total energy in neutral pions. Pions are the lightest mesons, that is particles composed of a quark and an anti-quark. They get produced abundantly in highly energetic particle collisions. Neutral pions have a very short lifetime and decay almost immediately into photons. This means essentially all energy that goes into neutral pions is lost for the production of muons. Besides the neutral pions there are two charged pions and the more energy is left for these and other hadrons, the more muons are produced in the end. Reducing the fraction of energy in neutral pions also changes the rate at which secondary particles are produced and with it the penetration depth. This begs the question of course why the total energy in neutral pions should be smaller than present shower simulations predict. In their paper, the authors suggest that a possible explanation might be chiral symmetry restoration. The breaking of chiral symmetry is what accounts for the biggest part of the masses of nucleons. The pions are the (pseudo) Goldstone bosons of that broken symmetry, which is why they are so light and ultimately why they are produced so abundantly. Pions are not exactly massless, and thus “pseudo”, because chiral symmetry is only approximate. The chiral phase transition is believed to be close by the confinement transition, that being the transition from a medium of quarks and gluons to color-neutral hadrons. For all we know, it takes place at a temperature of approximately 150 MeV. Above that temperature chiral symmetry is “restored”. In their paper, the authors assume that the cosmic ray shower produces a phase with chiral symmetry restoration which suppresses the production of pions relative to baryons. They demonstrate that this can be used to fit the existing data, and it fits well. They also make a prediction that could be used to test this model, which is a correlation between the number of muons and the penetration depth in individual events. They make it very clear that they have constructed a “toy model” that is quite ad-hoc and mainly meant to demonstrate that the energy fraction in neutral pions is a promising parameter to focus on. Their model raises some immediate questions. For example it isn’t clear to me in which sense a cosmic ray shower produces a “phase” in any meaningful sense, and they also don’t discuss to what extent their assumption about the chirally restored phase is compatible with data we have from heavy ion physics. But be that as it may, it seems that they’re onto something and that cosmic rays are about to teach us new lessons about the structure of elementary matter. A super model. Simple, beautiful, but not your reality. If you want to test quantum gravity, the physics of the early universe is promising, very promising. Back then, energy densities were high, curvature was large, and we can expect effects were relevant that we’d never see in our laboratories. It is thus not so surprising that there exist many descriptions of the early universe within one or the other approach to quantized gravity. The intention is to test compatibility with existing data and, ideally, make new predictions and arrive at new insights. In a recent paper, Burgess, Cicoli and Quevedo contrasted a number of previously proposed string theory models for inflation with the new Planck data (arXiv:1306.3512 [hep-th]). They conclude that by and large most of these models are still compatible with the data because our observations seem to be fairly generic. In the trash bin goes everything that predicted large non-Gaussianities, and the jury is still out on the primordial tensor modes, because Planck hasn’t yet published the data. It’s the confrontation of models with observation that we’ve all been waiting for. The Burgess et al paper is very readable if you are interested in string inflation models. It is valuable for pointing out difficulties with some of these approaches that gives the reader a somewhat broader perspective than just data fitting. Interesting for a completely different reason is the introduction of the paper with a subsection “Why consider such complicated models?” that is a forward defense against Occam’s razor. I want to spend some words on this. Occam’s razor is the idea that from among several hypotheses with the same explanatory power the simplest one is the best, or at least the one that scientists should continue with. This sounds reasonable until you ask for definitions of the words “simple” and “explanatory power”. “Simple” isn’t simple to define. In the hard sciences one may try to replace it with small computational complexity, but that neglects that scientists aren’t computers. What we regard as “simple” often depends on our education and familiarity with mathematical concepts. Eg you might find Maxwell’s equations much simpler when written with differential forms if you know how to deal with stars and wedges, but that’s really just cosmetics. 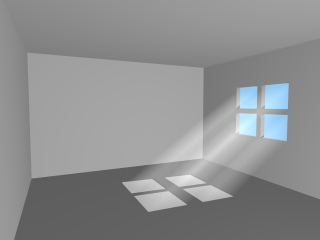 Perceived simplicity also depends on what we find elegant which is inevitably subjective. Most scientists tend to find whatever it is that they are working on simple and elegant. Replacing “simple” with the number of assumptions in most cases doesn’t help remove the ambiguity because it just raises the question what’s a necessary assumption. Think of quantum mechanics. Do you really want to count all assumptions about convergence properties of hermitian operators on Hilbert-spaces and so on that no physicist ever bothers with? There’s one situation in which “simpler” seems to have an unambiguous meaning, which is if there are assumptions that are just entirely superfluous. This seems to be the case that Burgess et al are defending against, which brings us to the issue of explanatory power. Explanatory power begs the question what should be explained with that power. It’s one thing to come up with a model that describes existing data. It’s another thing entirely whether that model is satisfactory, again an inevitably subjective notion. ΛCDM for example fits the available data just fine. For the theoretician however it’s a highly unsatisfactory model because we don’t have a microscopic explanation for what is dark matter and dark energy. Dark energy in particular comes with the well-known puzzles of why it’s small, non-zero, and became relevant just recently in the history of the universe. So if you want to shave model space, should you discard all models that make additional assumptions about dark matter and dark energy because a generic ΛCDM will do for fitting the data? Of course you shouldn’t. You should first ask what the model is supposed to explain. The whole debate about naturalness and elegance in particular hinges on the question of what requires an explanation. I would argue that models for dark energy and dark matter aim to explain more than the available data and thus should not be compared to ΛCDM in terms of explanatory power. These models that add onto the structure of ΛCDM with “unnecessary” assumption are studied to make predictions for new data, so that experimentalists know what to look for. If new data comes in, then what requires an explanation can change one day to the next. What was full with seemingly unnecessary assumptions yesterday might become the simplest model tomorrow. Theory doesn’t have to follow experiment. Sometimes it’s the other way round. The situation with string inflation models isn’t so different. These models weren’t constructed with the purpose of being the simplest explanation for available data. They were constructed to study and better understand quantum effects in the early universe, and to see whether string theoretical approaches are consistent with observation. The answer is, yes, most of them are, and still are. It is true of course that there are simpler models that describe the data. But that leaves aside the whole motivation for looking for a theory of quantum gravity to begin with. Now one might try to argue that a successful quantization of gravity should fulfill the requirement of simplicity. To begin with, that’s an unfounded expectation. There really is no reason why more fundamental theories should be simpler in any sense of the word. Yes, many people expect that a “theory of everything” will, for example, provide a neat and “simple” explanation for the masses of particles in the standard model and ideally also for the gauge groups and so on. They expect a theory of everything to make some presently ad-hoc assumptions unnecessary. But really, we don’t know that this has to be the case. Maybe it just isn’t so. Maybe quantum gravity is complicated and requires the introduction of 105 new parameters, who knows. After all, we already know that the universe isn’t as simple as it possibly could be just by virtue of existing. But even if the fundamental theory that we are looking for is simple, this does not mean that phenomenological models on the path to this theory will be of increasing simplicity. In fact we should expect them to be less simple by construction. The whole purpose of phenomenological models is to bridge the gap between what we know and the underlying fundamental theory that we are looking for. On both ends, there’s parsimony. In between, there’s approximations and unexplained parameter values and inelegant ad-hoc assumptions. Phenomenological models that are not strictly derived from but normally motivated by some approach to quantum gravity are developed with the explicit purpose to quantify effects that have so far not been seen. This means they are not necessary to explain existing data. Their use is to identify promising new observables to look for, like eg tensor modes or non-Gaussianity. In other words, even if the fundamental theory is simple, we’ll most likely have to go through a valley of ugly, not-so-simple, unshaven attempts. Applying Occam’s razor would cut short these efforts and greatly hinder scientific progress. It’s not that Occam’s razor has no use at all, just that one has to be aware it marks a fuzzy line because scientists don’t normally agree on exactly what requires an explanation. For every model that offers a genuinely new way of thinking about an open question, there follow several hundred small variations of the original idea that add little or no new insights. Needless to say, this isn’t particularly conductive to progress. This bandwagon effect is greatly driven by present publication tactics and largely a social phenomenon. Occam’s razor would be applicable, but of course everybody will argue that their contribution adds large explanatory value, and we might be better of to err on the unshaven side. If a ball rolls in front of your car, the simplest explanation for your observation, the one with the minimal set of assumption, is that there’s a ball rolling. From your observation of it rolling you can make a fairly accurate prediction where it’s going. But you’ll probably brake even if you are sure you’ll miss the ball. That’s because you construct a model for where the ball came from and anticipate new data. The situation isn’t so different for string inflation models. True, you don’t need them to explain the ball rolling; the Planck data can be fitted by simpler models. But they are possible answers to the question where the ball came from and what else we should watch out for. In summary: Occam’s razor isn’t always helpful to scientific progress. To find a fundamentally simple theory, we might have to pass through stages of inelegant models that point us into the right direction. The third of our videos about researchers at Nordita! Here you meet Oliver Gressel from our astrophysics group. Oliver works on numerical simulations of turbulence and magnetic fields in plasma. We previously discussed how this improves our understanding of sunspots and the solar dynamo. With the same tools, Oliver studies a different plasma, the interstellar plasma that permeates our galaxies. In the video, he explains what we know and don't know about galactic magnetic fields and what we can learn from the numerical simulations. If you have any news items from the Nordic countries that are relevant to research in physics or related fields (eg mathematical physics, biophysics) and that you would like to see included in the next issue of the newsletter (due early October), just send me an email to hossi at nordita dot org. Last month I gave a seminar in Bielefeld on models with a minimal length scale. This seminar was part of a series organized within the framework of the new research training group "Models of Quantum Gravity". The initiative is funded by the German Science Foundation (DFG), and several universities in Northern Germany take part in it. I find this a very interesting development. The Germans seem to finally have recognized the need to support research in quantum gravity generally, rather than singling out specific approaches, and this initiative looks promising to me. Let's hope it is fruitful. My trip to Bielefeld was interesting also in another aspect. When I was about to get on the way back to Heidelberg, the car wouldn't start. After some cursing and fruitless attempts to decode the erratic blinking of the panel lights, I called the closest Renault dealer. (Actually, I first called my husband to yell at him, just because that was the first thing that came to my mind.) The Renault guy said, Guten Tag and tough luck, we'll have to tow the car, but it's five to five now so please call back tomorrow morning. So I unexpectedly had to spend the night out of town, which I took as an excuse to buy really expensive underwear. They towed the car the next morning, figured out that the battery had died in a short-circuit that blew up some wiring, and I made it back home with 24 hours delay. The irony in this was that I had taken Stefan's car because I was afraid mine would break down and I'd get stranded in Bielefeld. Tomorrow I'm giving a seminar in Aachen and I hope that this time the car won't break down... Later this month I will try to listen in at a black hole conference in Frankfurt. Unfortunately, this happens to be during the week when our daycare place has summer break, so the logistics is nontrivial. In September I'll be in Helsinki for another seminar. In October I'm on a conference in Vienna. In November I'm attending a workshop in the UK, which for all I can tell doesn't have a webpage and I'm not entirely sure what it is about either. There's been some discussion in the blogosphere lately about the difficulty of combining the necessary travel to seminars and conferences with family demands. And yeah, what do you expect, it's not easy and it's not fun. Sometime when I'm writing these Internas about work-family issues, I feel like a case study in the making. The girls are doing fine and have adjusted well to the new daycare place. So far, we're very happy with it. It's a nice and fairly large place with a playground and much space to run around. They're very well organized and it's not exceedingly costly either. Some weeks ago the kids were ill, and I called in at the daycare place to say we're not coming. When somebody picked up the phone and I heard a male voice, my first thought was that I must have dialed a wrong number. Needless to say, I then felt bad for my own stereotyping, and that I was apparently surprised the childcare business is not exclusively run by women. If you Google for the job description "Kindererzieher" in German, auto-complete gives you as first hit the female ending of the word. To be fair to myself though, the guy hadn't been there previously. He was only there as a temporary replacement, and normally a woman called Stephanie would answer the phone. In any case, I later had an interesting conversation with him about gender imbalance in education. His explanation for why there are so few men in his profession was simply that it's badly paid. "You can't feed a family from this." I'm not sure that really explains much though. Lara and Gloria's vocabulary has exponentially grown in the last month. No day passes without them trying out new words. At this point we actually have to be careful what we tell them because they'll go around and tell everybody who'll listen that the mommycar is broken and will shamelessly repeat my complaints that the neighbors don't separate their garbage. They have meanwhile pretty much taken over the whole apartment. There doesn't seem to be any place that's not occupied with toys or other child paraphernalia. And I, I spend a considerable amount of time collecting building blocks and lego pieces, a genuinely sisyphean activity. In summary, life is busy. In March, Lawrence Krauss took part in a discussion hosted by an Islamic group at University College London. He evidently did not expect what he saw upon arrival, that all women were sitting in the back and (according to this newspaper report) men were prevented from sitting among the women. This YouTube clip captures Krauss’ refusal to be part of such an event, and his request that the segregation be quit. His demands were eventually met. There is some disagreement in the newspapers on whether or not the gender segregation was voluntary. Be that as it may, I can understand Krauss’ reaction and would probably have done the same. So there’s this guy, Sturmark, who tells us on his website that he’s editor of a journal for cultural and intellectual debates and who, on Wikipedia, is described as “prominent debater on religion and humanism in Swedish media.” This “intellectual” evidently thinks it’s funny to pretend that string theorists have to sit in the back of the room, like suppressed and disadvantaged women in certain religious groups. To make matters worse, he is clearly reading his introduction off, so it’s not like that was the kind of spontaneous joke that came out wrong. It was a deliberately made comparison. It was probably made because he thought that it would amuse the audience. 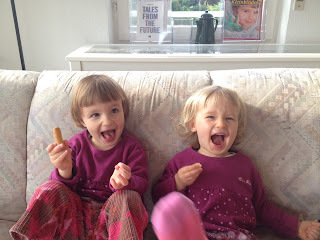 And though I can’t say that they were exactly rolling on the floor, you can hear some laughter in the recording. Sturmark doesn’t seem to have an education in physics (according to Wikipedia he has a BA in computer science), so it appears fair to say that he probably doesn’t know what he’s talking about. And evidently he thought it okay to make jokes about string theory without knowing what he’s talking about. Because everybody does it, right? Imagine he’d have said “Material scientists have to sit in the back. I hope that’s okay.” Haha. Wait. WFT? My problem isn’t so much with Sturmark himself – the world is full with guys who think they’re oh-so-smart and who need a haircut. He’s hardly the first to make fun of string theorists, and he probably won’t be the last. No, my problem is the impression that jokes and condescending remarks about string theorists have become acceptable in general. This isn’t an “intellectual debate”. This is a sickening way of making brainless jokes about a whole group of scientists. Yes, some of the stuff that they work on will turn out to have no relevance for our understanding of nature. The same can be said about literally all research areas. Yes, some of them seem to have gone off the deep end. But one shouldn’t extrapolate from single points of data. No, I’m not a string theorist. No, I’ve never even worked on string theory. No, I’m not married to a string theorist either. Or if, he’s hiding it well. Yes, I think more attention should be paid to making contact to experiment, that’s why I work on the phenomenology of quantum gravity. I want to know how to describe quantum effects of space and time and, whether you like that or not, string theory was and is still among the best candidates. I think it’s really bad taste to make fun of scientists just because they are interested in certain research questions. What worries me much more than the bad taste though is that scientists of course take note of the public opinion, consciously and unconsciously. Scientists make deliberate efforts to keep discussions and evaluations objective in order to be able to make accurate assessments of the promise of certain research directions. And this strive for objectivity is greatly skewed by publicly ridicule. In comparison to the struggles for women’s rights this is a petty issue of course. But it’s about a topic, quantum gravity, I care deeply about, even if the biggest part of the world doesn’t. Having said that, if you watch the first 15 minutes or so of Krauss’ lecture you’ll note that he makes a whole series of jokes and fails to elicit laughter from the Scandinavians, which is quite amusing in its own right. If you’ve ever given a talk somewhere in North Europe, you can probably relate. He didn’t exactly help his situation by self-deprecating remarks about the USA - Italians might have been laughing their butts off, but Swedes are much too polite for this. Be that as it may, Krauss’ lecture is well structured and well delivered, though I guess that most of you won’t actually learn anything new from it.